Where else can you see Parisian pussycats dancing the Can-Can at the Mewlon Rouge but in GAY PURR-EE? This animated musical feature from UPA Studios was a bit more adult themed than it’s Disney counterparts, at least by 1962 standards. 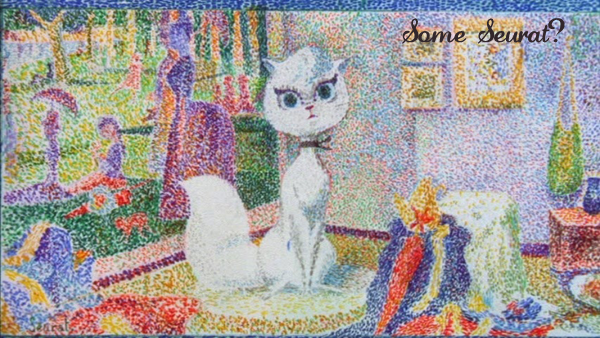 It’s the story of Mewsette, a country cat in 1890’s Provincial France who dreams of living the life of a big city kitty in Paris. One day she decides to chuck it all and hops on her mistress’s sister’s coach to head for the City of Lights. 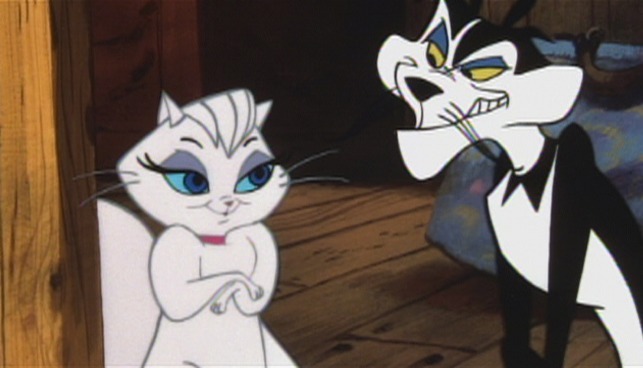 Her boyfriend, the mouse-catching Jaune-Tom, and his amusing little pal Robespierre, set out to find her and rescue her from the clutches of the scoundrel Meowrice, who together with Madame Rubens-Chatte plan to train Mewsette in the ways of the world and sell her off to a fat American cat. The vocal stars of GAY PURR-EE are Robert Goulet, fresh off his Broadway success in CAMELOT, and the one-and-only Judy Garland. Judy’s film career had been at a standstill since the box office failure of 1954’s A STAR IS BORN (now considered a classic), and she owed big bucks to the IRS. But her singing career was still going strong, and getting Garland to do an animated film was considered quite a coup. Judy had only one demand, though: she had the filmmakers hire Harold Arlen and E.Y. Harburg to write the songs, the duo responsible for the tunes in Garland’s greatest hit, THE WIZARD OF OZ, and her signature song “Over The Rainbow”. Arlen and Harburg didn’t disappoint. The songs in GAY PURR-EE are Broadway quality, and Judy adds her own inimitable style to “Little Drops of Rain”, “Take My Hand, Paree”, and “Paris is a Lonely Town”. Goulet gets to show off his baritone on “Mewsette”, and even voice actor extraordinaire Paul Frees (Meowrice) sings two humorous tunes, “The Money Cat” and “The Horse Won’t Talk”. Red Buttons can be a bit annoying as comic relief cat Robespierre, but he’s there mainly for the kiddies (no, not kitties!). Hermione Gingold lends her unique voice to Madame Rubens-Chatte, and Man of 1000 Voices Mel Blanc shows up as a burly bulldog. Morey Amsterdam is the narrator, and a man on a ship shanghaied along with Jaune-Tom and Robespierre. 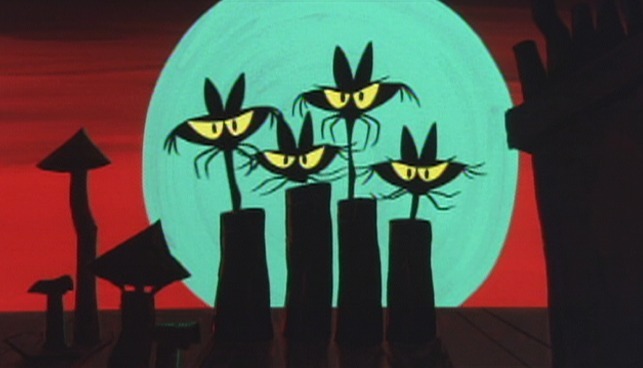 Special shout-out to The Shadow Cats, Meowrice’s silent henchmen. Delineated all in black, with shifty yellow eyes, these bungling criminal cats add an amusing dimension to the nefarious doings of Meowrice. The movie is done in limited-animation style, colored in a gorgeous pastel palette. 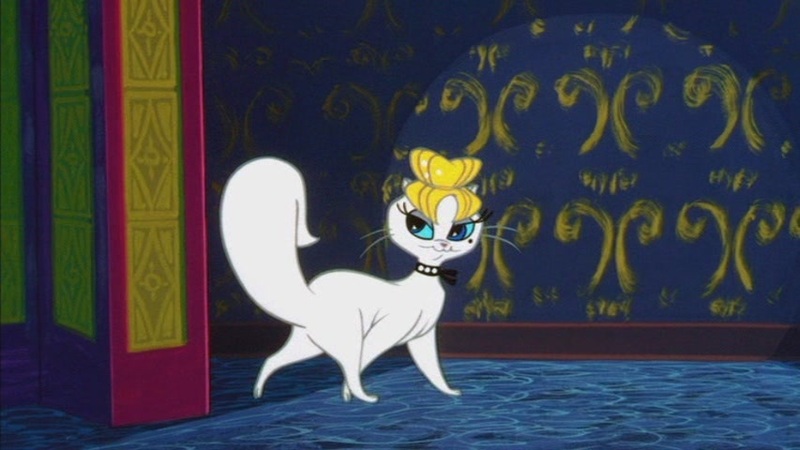 One scene that stands out is in the film’s middle, with Meowrice writing to American groom-to-be Mr. Henry Phtt about Mewsette’s progress. 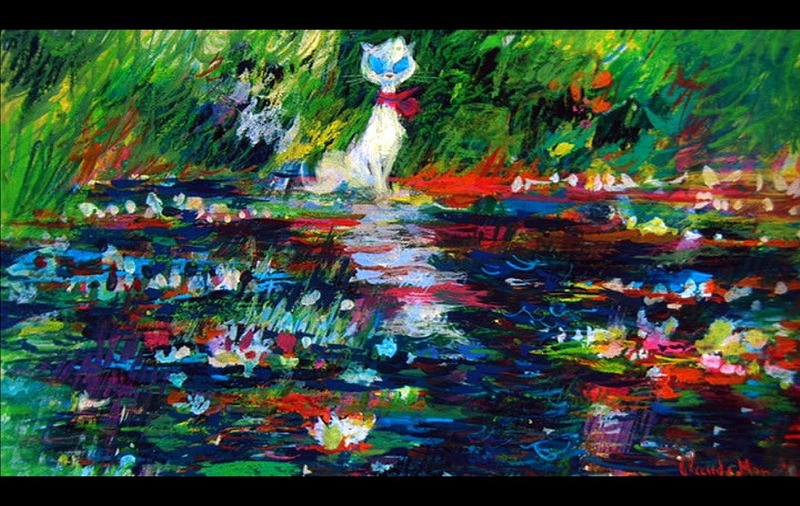 A series of portraits of the feline fatale are shown in the styles of painters Cezanne, Gauguin, Monet, Picasso, Renoir, Rousseau, and Toulouse-Lautrec, among others. The visuals here are outstanding, and the colors pop with vibrancy. Director Abe Levitow got his start working under Warner’s cartoon king Chuck Jones, and their styles are very similar. 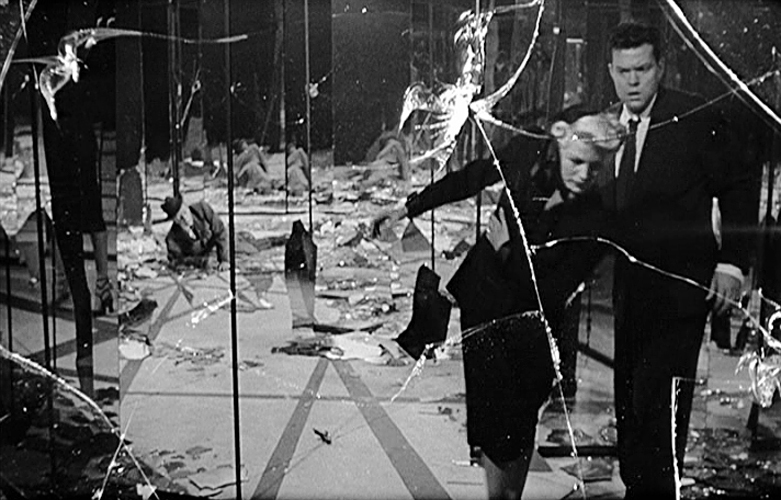 Jones himself wrote the screenplay with his wife Dorothy, and when Warner found out afterwards, they promptly fired him for breeching his exclusive contract with the studio. Chuck bounced back quicker than Wile E. Coyote, moving to MGM to take over their TOM AND JERRY shorts, with the TV classic HOW THE GRINCH STOLE CHRISTMAS soon on the horizon. 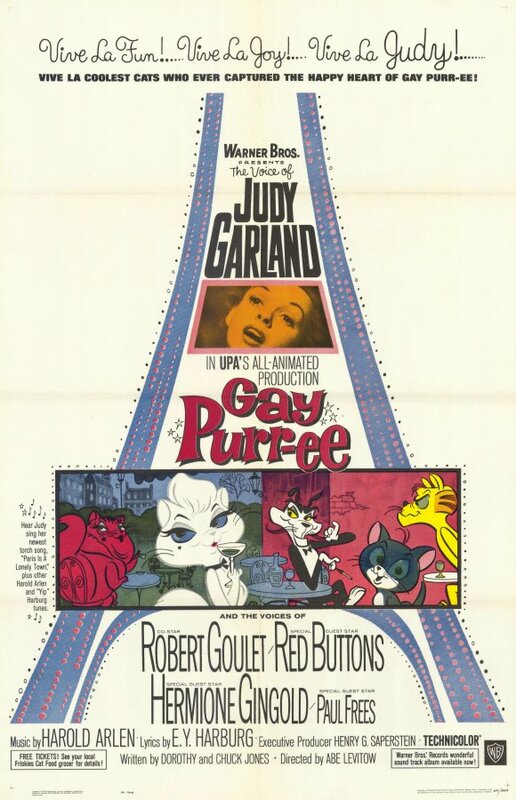 GAY PURR-EE is fun for film fans, an interesting experiment in animation that’s not quite a classic, but still very watchable today. The visuals are lovely to look at, the vocal talents delightful, and we get to hear Judy sing some wonderful Arlen and Harburg songs one more time. I’d give it two paws up! Wait a minute. Why have I never seen this? Judy Garland and Robert Goulet? An animated film set in Paris? what in tarnation is wrong with me? Thank you for bringing this to my attention. You’ve performed a valuable public service here today – I’m serious! TCM has run it twice recently! You’ve got to catch it, it’s really good… especially those Shadow Cats! They steal the show!